The union with Greece changed the political and administrative system. Samos had become a free Greek province. Naturally, the people's lives changed. The frequent communication with Asia Minor, where Greek populations lived under the Ottoman rule, was reduced and finally stopped in 1922. During the first World War, Greece participated in the Entente alliance. From such position, it managed to free the area of Smyrna, but the Greek army lost by the Turks who forced nearly all the Greek people of Asia Minor to leave, realizing a nationalistic politics that dated from 1914. Approximately 1,500,000 Greeks came to Greece as refugees, abandoning their ancestral lands where Greek populations lived for 3,000 years. 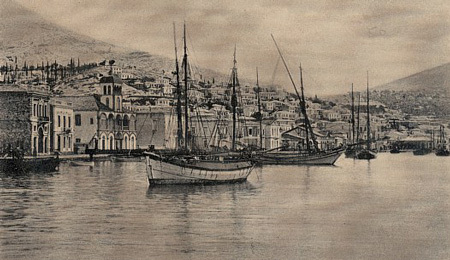 The largest wave of refugees was that of 1922, after the destruction of Smyrna, causing a sudden increase to the island's population. Many refugees settled permanently down at the island, in villages and towns. Later, they built their own neighborhoods, called "Prosfyghika" ("The Refugees' neighborhood"). Others used Samos as an intermediary link to other places in Greece. The refugees that inhabited the island gave a different aspect to its life, despite the difficulties they faced. They brought knowledge, methods of land cultivation and a whole new culture with them. They also provided a cheap work-force for the tobacco industries. In the period between the wars, Samos tobacco and tanning industry flourished. In 1934 the Union of Viniculture Cooperatives of Samos was established and within a short time it displaced the old wine merchants. However, the tanning and tobacco industry declined soon after the second World War.